Core Audio, the only media framework available since day one of the public iPhone SDK, offers extremely low latency and powerful access to the device's audio processing system... assuming you can handle what's renowned as one of the hardest APIs on the platform. In iOS 5, Core Audio gets even better, with great new features that had previous been burdensome, if not impossible, to develop on your own. Once the iOS 5 NDA drops, the shiny new bits will be available to all, and this talk will be one of your first chances to learn how they work. Attendees will learn the basics of Core Audio -- the engine APIs that process sound (Audio Queue, Audio Units, and OpenAL) and the helper APIs that get samples into and out of them -- and then look where iOS 5 fills in some of the holes that have existed up to now. Extremely informative. Very obvious that the presenter had deep knowledge of content and was able to deliver effectively. I learned a lot about Core Audio in this session and the demos were really fun. Apple's Human Interface Guidelines (HIG) specify how Apple-provided interface elements can be used in apps. There are lots of rule; there are a limited set of interactive elements. Why limit yourself? In this session, author and developer Shawn Welch shows you how to break out of the HIG. Join him as he shares case studies showcasing the development of unique looks and feel. Welch will provide inspiring ideas for your own applications and discuss the process that makes them possible. 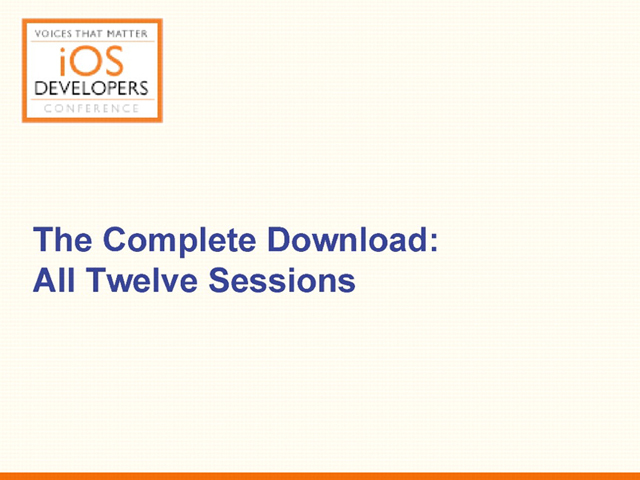 When you complete this session, you'll have discovered how developers have trail blazed their own custom UX, plus you'll have learned important lessons on how you can do the same in your own apps. One of the best talks of the conference. Very useable code. Learned a lot! Lots of good app examples. A good combination of overview, design, and implementation with value for both developers and designers. Excellent examples and explanations. Presenter was clear, concise, and well prepared. The App Store gold rush wasn’t really a gold rush — it’s the new How Things Are. It’s bigger than a gold rush. What does that mean? How do we developers and designers prepare for it? The Voices That Matter: iOS Developer Conference took place in Boston in November 2011. It was an opportunity for developers to hone their skills by adding best practices to their development toolbox. This Games Session bundle brings you seven conference sessions that are of particular interest to game designers and developers. You, too, can learn how the latest Apple iOS technologies affect your projects and how you can leverage the latest features in your applications. These high quality recordings will make you feel as though you were there and will insure you have the most up-to-date opinions, methods and techniques in your arsenal. Learned something out of almost all the sessions I attended. Especially appreciated the insights about things you cannot "Google."